If you would like to make a sponsorship selection online, please visit our SPONSORSHIP FORM. You can also download here a conference sponsorship packet that will explain the available sponsor packages and levels of support. We greatly appreciate your investment in the cause of Community Action! Every year, the Arkansas Community Action Agencies Association hosts its Annual Conference for staff, board members, and stakeholders from our 15 Community Action Agencies around the state. This is an opportunity for our attendees to learn not only from experts in their field, but also from one another — a chance for the state’s agencies to share knowledge with one another so that we can all reaffirm our collective commitment to reduce poverty and create thriving communities in Arkansas. This year’s conference is going to be from April 25 to 27 at the Wyndham Riverfront Hotel in North Little Rock. Your sponsorship would allow a great opportunity for exposure to our statewide network with on average over 200 attendees from across the state, including some of our national partners as well. 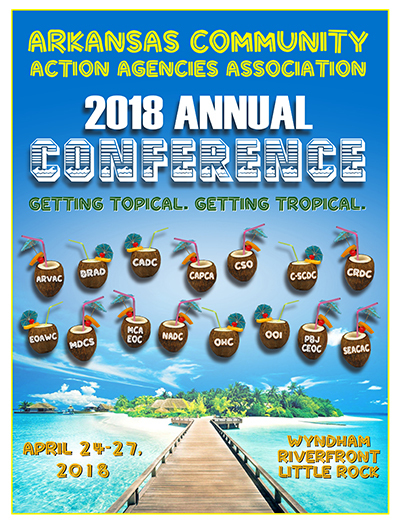 2018’s Conference theme is a tropical luau—a reminder that, even though Community Action may be serious business, there can always be fun and enjoyment found in even the most demanding work.